The second Gauteng North Wilson Mini Tournament took place at the Groenkloof Tennis Stadium in Pretoria over the past two weekends. The event saw players from all over Gauteng compete for national rankings. 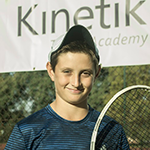 The tournament concluded on Sunday, 10 September and students from Kinetik Tennis Academy proved that training does pay off. 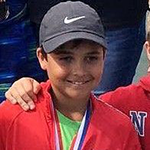 Although Aleks Simovski still plays in the Boys U/14 age group, he entered the Boys U/16 singles division and had a great run to finals where he lost to Devin Badenhorst from Gauteng North. In the Boys U/14 singles event, Ben Scott fought his way to the end of the draw, after having to withdraw in the finals to his opponent, Jordan Georgiev. Brendan Smith rallied to the semi-finals of the Boys U/12 singles event after losing in three sets. 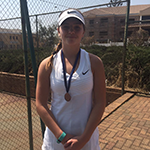 Goegia Hosking made it to the semi-finals of the Women’s U/16 singles event and finished third with Polia Gizdova (U/14 Women’s Singles) exited in the quarter-finals of her event. And earlier in August this year, at the Daveyton Y-Tex Spring tournament, Ryan Christiansen went on to win both the Boys U/16 Singles and Doubles event with his partner, Kian Steyn. In the Girls U/14 Singles event, Ané Dannhauser made it through to the finals and took second place. Isabella du Toit made it through the Quarter-Finals of the Girls U/12 event. We are tremendously proud of the progress all our players have made this year and know that with more training they will go on to achieve even more in the coming year. This entry was posted in News, Tournament Results. Bookmark the permalink.